International Cub Cadet makes legendary machines, and the Cub Cadet ZTR lawn mowers are no exception. Cub Cadet has been in the mower business since the beginning, and their products are well engineered. This brand has developed a cult-like following over the years, and for good reason. Their line of ZTR mowers has been well thought out and engineered to mow lawns quickly and efficiently. Cub Cadet is now owned by the MTD company. Although sharing the spotlight with the other sister brands of MTD, Cub Cadet has maintained an excellent product line that meets a variety of budgets and lawn mowing needs. This is a quality product. All the Cub Cadet ZTR mowers feature the ‘3 in 1’ option,allowing for side discharge, mulch, or rear bagging. The deck cutting height is adjusted manually using a lever, or with a foot control on the more expensive models. The frames on all the Cub Cadet ZTR models is fully welded steel ( no bolts and nuts to come loose, compromising the frame strength). The more expensive models feature a 1.5” tubular steel frame, which gives added strength and stability. Cub Cadet ZTR mowers are available in 2 model series - the RZT (Residential Zero Turn) and the Z-Force (heavy duty). The Z-Force models are more expensive, and are equipped with heavy duty engines and more sturdy transmissions. There are four RZT models available, and three models in the Z-Force series. The RZT series offers a choice between a single cylinder Kohler Courage engine, or a Kohler twin cylinder engine. Horsepower ranges from 20 HP ( single cylinder) to 24 HP (twin cylinder). Both versions of the engine feature a pressurized oil system, with a replaceable oil filter. The lap bars controlling speed and direction are 2-way adjustable. All the RZT mowers have an electric PTO to engage the cutting blades, which is activated by flipping a switch. The cutting deck is fabricated out of stamped steel on all the RZT models. Adjusting the deck height is accomplished by a multi-position hand lever. Model RZT 42 comes with a 42” twin blade cutting deck, and is powered by the lower horsepower single cylinder engine. Model RZT 50 has a 3 blade 50” cutting deck, with either a 22 or 24HP engine. To continue the trend, RZT 54 powers a deck that leaves an impressive 54” swath. Check out the 24 HP engine, which provides plenty of power. Count on spending between $2600.00 to $3500.00 for the mowers in the RZT series. The four higher priced machines built by Cub Cadet include the models in the Z-Force Series. Here the choice is between either a 20 or 23 HP twin cylinder overhead valve ( OH) heavy duty engine. Both versions of the engine feature a pressurized oil system, with a replaceable oil filter. The lap bars controlling speed and direction are 3-way adjustable. All the Z-Force mowers have an electric PTO to engage the cutting blades, which is activated by flipping a switch. The cutting deck is fabricated out of fabricated steel, which is much more durable than a stamped steel deck. Adjusting the deck height is accomplished by a foot pedal, instead of using a hand lever. Model Z-Force 44 comes with a 44” triple blade cutting deck, and is powered by the 20 horsepower twin cylinder engine. Model Z-Force 48 has a 3 blade 48” cutting deck, with a 23HP engine. Model Z-Force 50 has a 3 blade 50” cutting deck, also powered by the 23HP engine. It leaves a 50” cut in the rear view mirror. The heavy duty 23 HP engine cranks out plenty of power where it is needed. Count on spending between $3900.00 to $4600.00 for the mowers in the Z-Force series. 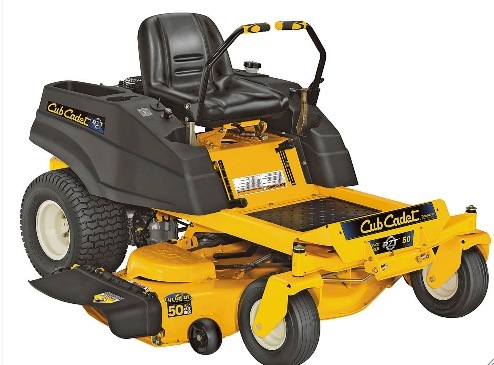 Most customers that purchase a Cub Cadet ZTR lawn mower buy another in the future, based on high satisfaction.